Grundy Television / Fremantle Media / Seven Network Australia. 2005. Executive Producer: Jonathon Summerhayes. CD (OP) Sony. 88883785152. 2013. 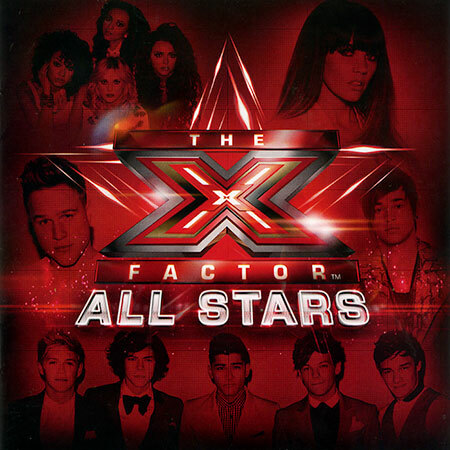 “X FACTOR ALL STARS, THE”. What Makes You Beautiful. One Direction. What You’ve Done to Me. Samantha Jade. Army of Two. Olly Murs. Want U Back. Cher Lloyd. Bleeding Love (Album version. Leona Lewis. You Bring Me Joy. Amelia Lily. Set Me on Fire. Bella Ferraro. Life is a Highway. Jason Owen. Don’t Fail Me Now. Melanie Amaro. Chloe (You’re the One I Want) (Album version). Emblem3. Power of a Love Song. Tate Stevens.